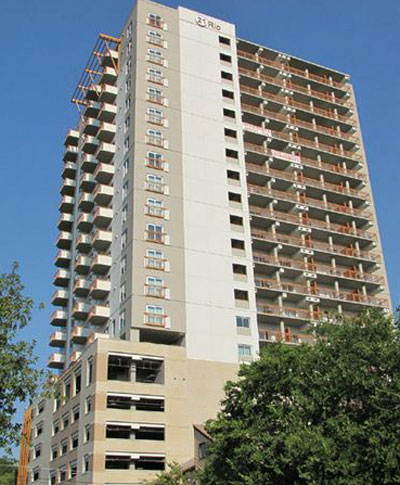 Nearly five years after three EIFS applicators fell to their deaths from a high-rise construction site in Austin, TX, a judge has ordered the scaffolding company in charge to pay $17,150 in fines. Mast Climber Manufacturing Inc. d/b/a American Mast Climbers, of Whitney, TX, contested the 2009 citations (eight serious, one willful) issued for safety hazards after the accident. The penalties originally totaled $86,800. In the Jan. 29 ruling, Administrative Law Judge Ken S. Welch affirmed the willful violation and two serious violations involving lift equipment set up at the site. The parties agreed to settle three serious violations, and the judge vacated the rest. One issue in the case was whether the mast climber system used on the project was a scaffold or aerial lift, as each are subject to different standards. The Occupational Health and Safety Review Commission judge heard the case Sept. 10-11, 2012, in Austin. Delays in the case over the years included a mandatory settlement attempt; the company's bankruptcy filing; and the withdrawal of the company's attorneys, the judge noted. Company owner William Mims represented himself at the hearing. The Austin case was the company's second fatal accident in 10 years. A woman who answered a telephone number listed for American Mast Climbers—founded in 2000 and shuttered in January 2010—noted that the company was now operating under a different name and said it did not want to comment. The case stemmed from an OSHA inspection of a condominium, 21 Rio, under construction near downtown Austin, TX. A mast climber system partially collapsed June 10, 2009, causing three workers to fall more than 100 feet to their deaths, according to OSHA. The workers—28, 30, and 40 years old, according to news reports—had been installing an exterior insulation finishing system (EIFS) on the 21-story building when the accident occurred. Three workers were applying EIFS to the 21 Rio apartment building in Austin, TX, when the lift equipment failed and they fell 100 feet to their death, according to OSHA. The workers, employed by Margate, FL-based Capoera Construction LLC, were pronounced dead at a nearby hospital. A first responder told a local NBC News affiliate that two of the workers had fallen 11 stories to the ground, after the scaffolding fell from the 11th story and landed on the seventh floor. One worker landed on the one of the floors just below the 11th level, he told the station. Witnesses said the workers had not been wearing harnesses, reports said. "The supported scaffold from which employees were working collapsed, causing workers to fall more than 100 feet to their death," Eric Harbin, OSHA's area director in Austin, said in a release from 2009. "If scaffolding parts had been inspected and replaced or repaired as needed, it is possible that this tragic accident and loss of life could have been avoided." American Mast Climbers had subcontracted with the project's general contractor to erect, disassemble, move and service the mast climber system on the project, according to case documents. Federal safety authorities doled out citations and proposed fines to four contractors on the project: American Mast Climbers, Capoera Construction, Andres Construction Services LLC (the general contractor), and Greater Metroplex Interiors Inc. (the contractor for the building exterior). The penalties ranged from $14,000 to $86,800. American Mast Climbers contested the citations. A request to OSHA regarding the three other cases was not immediately answered Wednesday (March 13) morning. OSHA originally cited American Mast Climbers for a willful violation, saying the company failed to have scaffolds designed by a qualified person and to construct and load them in accordance with that design. The citation carried a $70,000 fine. A willful violation is one committed with intentional, knowing or voluntary disregard for the law's requirements, or with plain indifference to employee safety and health. 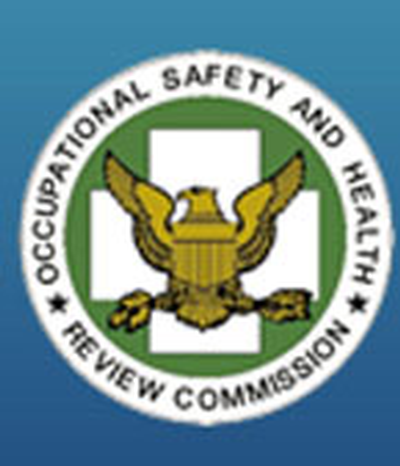 The Occupational Safety and Health Review Commission is the final arbiter of penalties in contested OSHA cases. The citation invoked 29 C.F.R § 1926. 451(a)(6), which sets performance-based criteria to protect employees from scaffold-related hazards such as overloading, structural instability, and falls. At the hearing, the company argued that the scaffold standards at §1926.451, “General Requirements,” did not apply to its system. The company contended that §1926.453, “Aerial Lift” requirements were applicable. Neither standard mentions “mast climbers” explicitly. The judge did not agree with the argument or afford weight to the letter, saying that the mast climber at issue satisfied the definition under §1926.451. 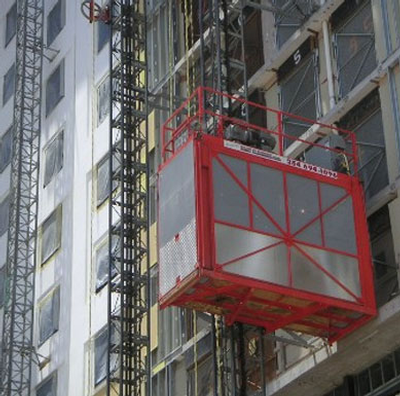 Aerial lifts “shall be designed and constructed in conformance with the applicable requirements of the ‘American National Standards of Vehicle Mounted Elevating and Rotating Work Platforms,’” said the ruling, citing the standard. The judge said that the American Mast Climbers’ system was not mounted to a vehicle. The case documents said the mast system, known as the “Millennium,” consisted of work platforms attached to either side of a motorized unit that traveled up and down a tower attached to the exterior of the building. “The tower was made of sections (modules) that were stacked on top of each other,” the documents note. OSHA had cited Mims’ previous company, Texas Mobile Scaffolding, in April 2000, as a result of another platform collapse in 1999, under the same standard. In 1999, a worker fell to his death from 240 feet in the air, reports said. The judge also upheld two serious citations in the current case. 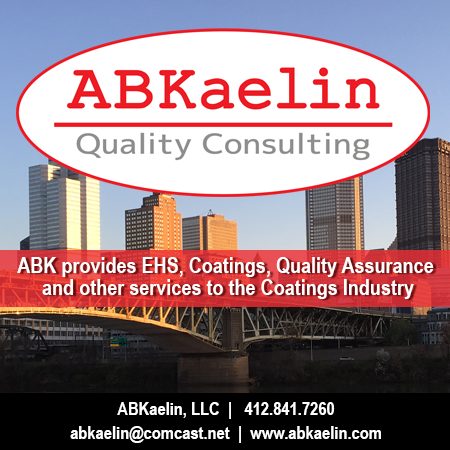 First, OSHA alleged that the company mixed scaffold components by different manufacturers without a competent person determining whether the scaffold was structurally sound, in violation of C.F.R. §1926.451(b)(10). There was no dispute that the scaffolding contained components from England and components manufactured by American Mast Climbers, the ruling said. Further, though Mims had worked with the mast climber system for 30 years, the judge agreed with OSHA that he was not a “competent person” as defined by the standard. Specifically, the judge pointed to the owner's conduct following the 1999 collapse. Mims had hired an engineering firm to analyze the failure. That report concluded that improper loading, untightened connections and the use of threaded bolts (as opposed to shank bolts) resulted in the bolt failure, the case documents said. Mims then terminated the engineering firm and “continued the same problems at the Austin project in 2009,” the decision said. “This was Mr. Mims’ second collapse of a mast climber platform within ten years, resulting in multiple employee fatalities,” according to the documents. Mims' experience was not sufficient, and he had no safety training or education from OSHA in recognizing hazards, the judge ruled, assessing a $2,000 penalty. Second, OSHA alleged that the company failed to have a competent person train each employee involved in erecting, moving, operating, repairing/maintaining, or inspecting a scaffold. American Mast Climbers' general foreman was responsible for training the site's crew; however, he was not found to be a competent person, under the rule. “He was not aware of the existence of AMC’s Operations Manual for the Millennium mast climber,” the ruling said. Further, crew members were found to be unaware of proper mast climber erection techniques, what tools to use, or any other requirements as presented in the manual, court documents said. The judge assessed a $2,000 penalty. Failing to attach a personal fall arrest system by lifeline to a vertical lifeline, horizontal lifeline or scaffold structure member. Failing to repair or replace damaged or weakened scaffold parts.